Affiliate Links // I pay for this subscription. As it heats up here in Seattle, it feels like summer is most definitely on its way. That’s exactly why I asked for a Stitch Fix this month that would be perfect for the heat. I know I’ve mentioned this several times now (sorry, not trying to humble brag, I promise!) but I’m leaving for Vegas the week after next, and I’ve been looking for some easy to travel with pieces that are appropriate for warm weather. I’m sure you know the drill by now, but if you’re new to my blog or Stitch Fix, it’s a clothing styling service that you can set up to receive monthly, or at your leisure. You are charged $20 as a styling fee that you can put towards anything you keep from your Fix. You can plan to receive five items – typically four clothing items and one accessory (jewelry or bags, typically). And, if you missed my review last month, then you may not know that Stitch Fix is now sending shoes! Be sure to update your profile with your shoe size if you haven’t already. 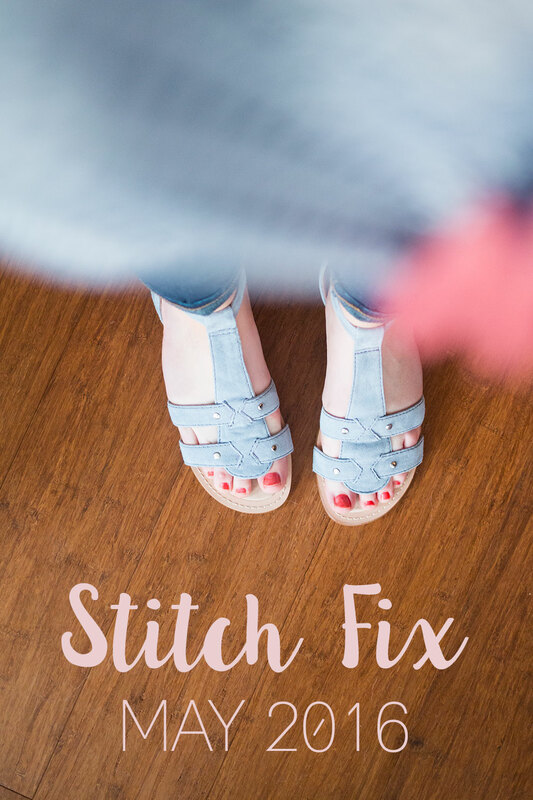 If you aren’t aboard the Stitch Fix train yet, now’s a good time to be, especially if you’re in the market for some cute new shoes! I received and kept a darling pair from MIA Shoes (similar style) last month (which I’m wearing right now, actually!) and received a cute pair of sandals this time around. Want to see what else I got? Then keep on reading! Speaking of shoes, here’s the pair I just mentioned receiving! These sandals are very cute, very comfortable, and the straps are super soft! Unfortunately, for me, these were just a tad too long and too narrow for my feet. If I were keeping these, I’d pair them with jeans and dresses alike. Here I’ve paired them with my Super Skinny Jeans from Old Navy. They’re a super dark wash which makes them appropriate for my casual office, and of course for running errands or whatever on the weekend. My mom happened to be over at my house when I was trying to my Fix, and I think this was her favorite top. The combination of mint green and crochet lace is perfection. My only issue with this top is the boxy cut. While I think it’s wearable, I wasn’t totally in love with it. I’ve paired this top with my white Levi’s CT 501 boyfriend jeans I got last spring and a bright pop of color in this Kate Spade Cedar Street Monda Crossbody. I love the subtle white on white, and I think the similar tones of the mint and the coral pair well together. I added a pair of blush sandals – they’re not the focus in this outfit, so the neutral color really works. 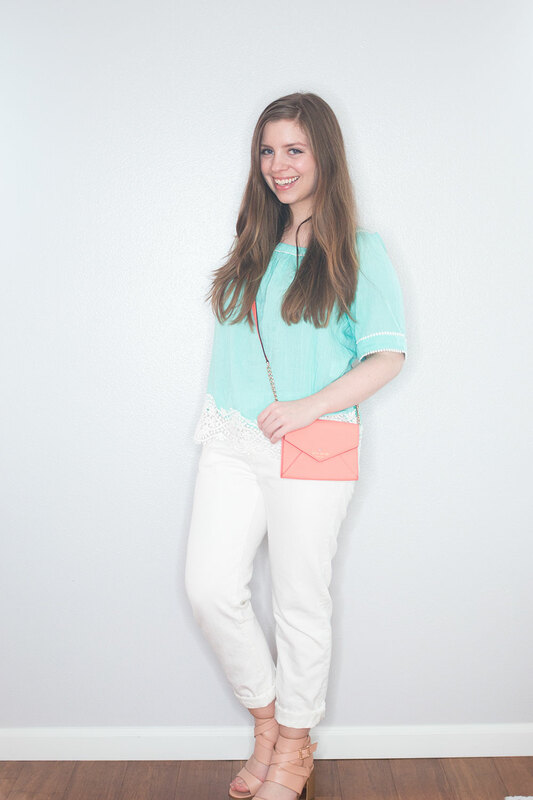 All three colors (mint, blush, and coral) are ones I’m loving for summer, so match made in heaven. I fell in love with this dress upon opening my package, and love it even more on! This was exactly the type of dress I wanted to have for my Vegas trip, and the bold red is perfect! The one problem? The material! While I love how lightweight it is, the linen material wrinkles so badly. Since I’m not sure what type of access I’ll have to a steamer or iron on my trip, I decide it was best to look for a cotton alternative. It just so happened I found almost the same cut of dress in a more forgiving material (100% cotton!) at ASOS. They’re also in the $20 range versus $60 and come in so many fun colors. I went with this light blue. However, they also have it in black, white, green, orange, pink and also available for petite and curvy sizes and also maternity! Mine should be coming tomorrow so I’ll be sure to update you on how I like it. 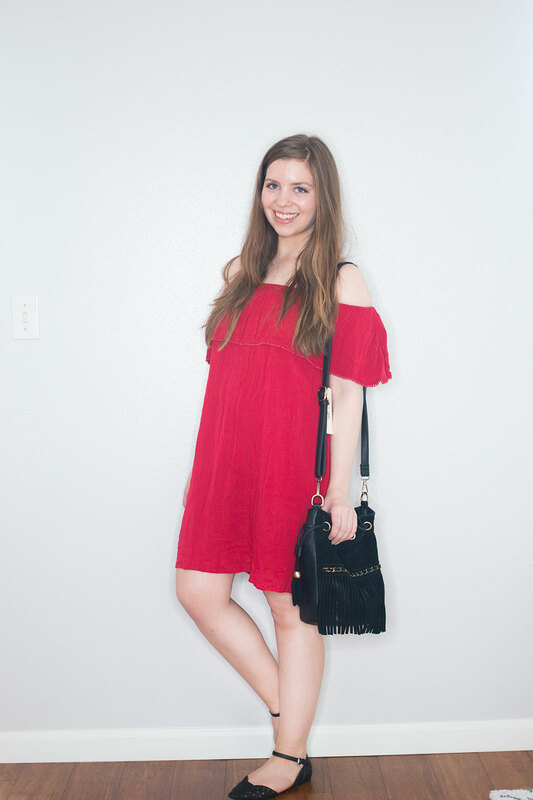 I paired this style of dress with a fun fringe crossbody bucket bag (similar style) and the MIA Shoes (similar style) that I kept from my April Stitch Fix! I wasn’t sure what I thought about this on taking it out of the box. There’s a lot going on here – embroidery, ruffles, and open shoulders. All things I like, but is it too much? I decided no and opted to keep this top! It’s like nothing I already own, and I think it will be perfect for my trip. I could see wearing this with white denim, boyfriend shorts, tucked into a skirt, or how I’ve styled it here with raw cut denim from Old Navy. What I’m getting at is it’s extremely versatile and will be an easy top to wear over and over again in different ways. I’ve opted to wear it with the sandals that were sent in this Fix for a casual vibe and paired it with a pop of bright pink with this Kate Spade Newbury Lane Sally Crossbody bag. Last but not least, I received this darling lace kimono from Pixley. I love this style of lace, and the short sleeve cut is unique. The problem I had with this came from the cut. While it’s not particularly apparent here, the kimono sits right on the center of my chest and doesn’t come all the way across, if that makes sense. Becuase this kimono has short sleeves, I think it’s paired best as a topper over sleeveless dresses. I opted to pair it with this bright colored sleeveless dress (similar style) and my trusty caged sandals from Target (this year’s version here). Because it’s been super sunny and bright lately, I’ve been loving wearing hats so I’ve paired it with the hat I recently wore in my culotte jumpsuit outfit from Brooklyn Hat Co and my trusty small bucket bag from Shaffer LA. Overall, this month was another great Stitch Fix. I never keep every single item (because honestly, I like shopping a bit too much to let someone else do it for me entirely). I am thrilled with the Fix overall, and the cold-shoulder top I kept will be worn all summer long. As usual, I can’t wait to see what comes in my June Fix! If you’re interested in trying out Stitch Fix and haven’t already, I’d sure appreciate you using my affiliate link. It helps me continue to bring you these reviews every month (since I pay for them myself!). What have you received in your Fix lately? Which piece(s) were your favorite or least favorite in mine? I’d love to hear all about it in the comments! I LOVE that red off the shoulder dress! Darling on you! Such great pieces in your Stitch Fix that look so good on you. Especially that dress!!!!! Gorgeous on you, from the style and the color. Aw, thank you Christy! I really liked it too! Such a bummer the shoes didn’t work for you-I love them! The top you kept is so pretty and unique! I like the idea of the lace kimono but you are right, the cut is a little off! Love the shoes, but a little pricy! That red dress is my absolute favorite! Love it! I really loved the lace kimono. It looks like it would be just right for a cooler Seattle evening. I, too, am loving the hotter days this NW Spring. I’ve been eating outside almost every lunch break. Ah I love that RD Style Vierra Off Shoulder Dress on you! And the lace kimono is so pretty! !